The 24th annual Nobel Peace Prize Forum—a conference that celebrates Nobel Peace Prize Laureates, international and national leaders—is March 1-3 in Minneapolis. 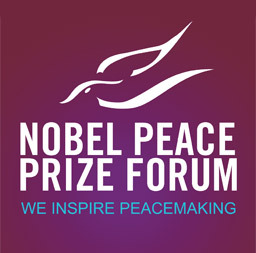 The 2012 Nobel Peace Prize Forum, which explores issues related to peacemaking and causes of conflict and war, includes tracks related to business, arts and music, education, and global studies. A special 50th anniversary presentation of Benjamin Britten's War Requiem will be performed as part of the event. The forum is organized by Augsburg College, in partnership with the Humphrey School of Public Affairs, and with ongoing sponsorship from the original college partners. The Nobel Peace Prize Forum is the only affiliation of the Nobel Institute outside Norway. It was founded during 1989 through a unique partnership between the Norwegian Nobel Institute and five private colleges—Augsburg, Augustana, Concordia (Moorhead), Luther, and St. Olaf. Registration is $40 per track for adults, $20 per track for students. Separate tickets are required for the performance of the War Requiem, and for the presentation by Dessa. For a complete schedule, to learn more, and to register, visit http://nobelpeaceprizeforum.org/. Specific room locations for each presenter will be available soon, and will be posted on the website. To learn more about the host and coordinator of the event, Augsburg College, visit http://www.augsburg.edu/. Major support is provided by The El-Hibri Charitable Foundation, Land O' Lakes, and Thrivent Financial for Lutherans.